Situated on the banks of the Mekong River and in the very center of Phnom Penh, we proudly provide our guests unrivalled combination of comfort and convenience. 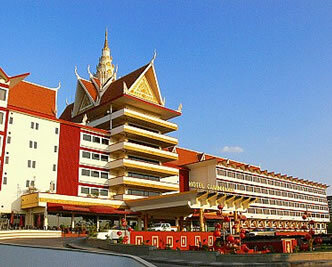 With ready access to both tourist and business landmarks along with sweeping views of one of the world’s great rivers, Hotel Cambodiana balances a proud sense of tradition with a commitment to maintaining its reputation for excellence. The opening of Cambodiana Hotel in 1962 was of great cultural significance to Cambodia, reflecting the bold sense of optimism and vision that has revived international interest in Phnom Penh and Cambodia. Inspired to continue this legacy, the team at Hotel Cambodiana will ensure you to experience the famous Khmer hospitality that inspires so many visitors to return time and time again. Hotel cambodiana in larger map.